Will I be drinking this again: It was pricey but probably yes. 7/22/2010: Met up with my buddy Ryan and his girlfriend at Sharp Edge for happy hour. Ryan makes some really good homebrew, and helped me through my first batch. I actually will be making a batch in the next couple weeks for my buddies wedding. Probably a franziskaner clone, with some honey malt to make it a little different. I always like to put my own spin on things. Oh and a bit of a side note, this might have been the slickest beer glass ever. There was actually a piece chiseled out of the wood block in the picture, and the bottom of the glass was cone shaped so it could rest IN the block. Therefore if you are a few beers deep, and not paying attention you could easily just set this on the table and spill it all over yourself. Leute Bok is brewed by the same people who brought us Gulden draak and Piraat Ale, so I am hoping the quality is similar. The nose is nice and fruity, with some charred smoke coming through. The flavor is green apples, cherries, light smoke, and some bakers chocolate. Light body and light flavors but they mix perfect. This is one of the more unique Belgian Strong Dark Ale’s I tried in quite some time. Picture of the day: Little miss duckface is out of control. Will I be drinking this again: Yes it is a pretty unique beer. 7/19/2010: Its been a while since I have had a good Belgian beer, so I decided it was time I stopped by The Sharp Edge. They are known for having the best selection of Belgian beer in Pittsburgh hands down. They also have a pretty nice happy hour; half price Belgian drafts from 4:30-6:30. The beer still ends up being $4-$5 per draft, which I guess isn’t terrible for Pittsburgh as far as pricing goes. A little bit of a side-note, why isn’t Belgian Stout a category on Beer Advocate? Troubadour Obscura is a chameleon of a beer. It starts off drinking like a stout, and finishes with some Belgian dark characteristics. The smell is sweet chocolate, and some dark fruit, figs maybe? The flavor is bitter roasted chocolate at the start, and dark spicy fruitiness by the end. The flavors are very subtle, but work very well together. The body is very light, and it has the nice bubbly mouthfeel usually associated with a Belgian. Overall this beer is very unique, and an easy tasty drink. 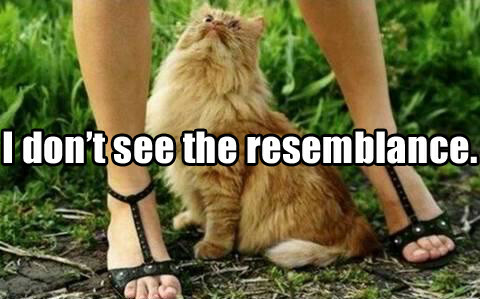 Picture of the day: I dont see the resemblance. Purchased at: Jared send this to me as an extra in a trade. Will I be drinking this again: Yes I liked this one a lot, a pretty affordable BSDA as well. 4/19/2010: My first beer from 21st Amendment. I am a huge fan of craft beer in cans, not quite sure why? This is also the first Belgian I have ever had from a can, so this should be interesting. I gotta admit a can looks kind of funny next to a chalice. The text on the can mentions that figs, vanilla, cinnamon, and oak are used in making this beer. You crack this bad boy open and you instantly smell dark fruits and vanilla. Not as much head as a normal BSDA. The taste is very good, figs, cherry, a nice splash of vanilla, and a pinch of cinnamon. I really am not getting any of the “oak” mentioned on the label at all. I give the taste of Monk’s Blood an A, but the mouthfeel is where it dropped a few points for me. It didn’t have that yeasty/bubbly/creamy feel that you love with a BSDA. Overall though for the price of this beer I was very impressed, and will be drinking it again. Picture of the day: Not the place you want to actually want to take your kids on bring your kids to work day. 1/08/2010: Three A or better ratings in a row? Yes this is a first. This is one of the few mainstream Unibroue beers I have yet to try. Hard to believe because it is considered by many to be their best, but it actually isn’t super easy to find in the burgh. The head on this beer didn’t come out quite like I was expecting. It was only slightly bubbly and not that creamy looking. The smell also was almost non-existent, but a bit fruity. The cliche “Don’t judge a book by its cover” without a doubt applies here. The taste is just awesome, so smooth. Very complex, with heavy malt to start, slight cherry, and a slight peppery taste. Also some spices in the background but I can’t quite pick out exactly what they are. ABV is hidden extremely well. The mouthfeel is a bit on the light side for a BSDA. I would have made this an A+ if the mouth feel was just a bit heavier, and if it had more of a good smell to it. 12/31/2009: This is one of the many beers my buddy Kevin from Denver brought back for me. Wanted to save it for a special occasion and figured what better than New Years Eve. I think they named this 2 turtle doves because after you finish the bottle, you get these little birds flying around your head just like in the cartoons. Similar to when Wile E. Coyote would fall off a cliff and smash his head, those kind of birds. I was pretty excited for this beer because of all the hype behind it. Unfortunately it did not quite live up to the hype. The smell is strictly roasted malt with some alcohol behind it. Flavor overall was very good. The major flavor to this one is chocolate, with an almost charcoaly aftertaste. The pecans advertised on the label do not come through for me at all. This also kind of feels like a hybrid between a belgian dark and a stout to me because it is so heavy. The killer here to me is the alcohol burn. I usually like super strong beers, but they did not do a very good job of hiding the ABV at all. By the time I got to the bottom of the bottle I was kind of choking it down. For the price I probably will not be drinking this one again. 12/29/2009: A couple months back I picked up a Chimay gift pack for $16 from Vintage Estate that included the Grand Reserve, Tripel, Premiere and the Chimay Chalice. That same gift pack in Pittsburgh runs $26-$28 so I couldn’t pass it up. Plus the chalice might just be the coolest looking beer drinking apparatus ever created. Onto the beer. The Chimay Blue (Grand Reserve) is widely regarded as one of the best of the Belgian Trappist beers, and I would have to agree. This isn’t quite as good as my favorite beer of all time Trappistes Rochefort 8, but it is top tier. The head on this beer is awesome and what you expect from a Belgian Dark. I have to say when people compare the taste of beers to dark fruits; currants/figs/plums, I am not able to pick that out. Mostly because I have never tasted any of these fruits on their own. All I know is this is a super easy drink for a 9% ABV beer. The taste and mouthfeel is actually much more mild that what I was expecting, but again it amazes me that they can pull this off while maintaining 9% alcohol by volume. If this beer was just a tiny bit sweeter I would have given it an A or A+. You have probably tried the Chimay Red (Premiere), but you need to give this one a try as well.